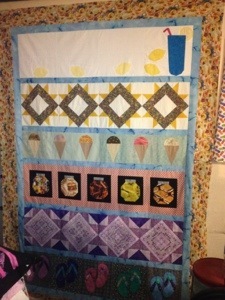 I didn’t have a lot of sewing time last week, so my rows didn’t get finished on the scrappy blue quilt. 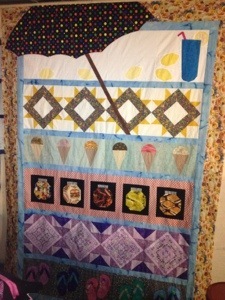 I had to take it down off the fall and finish my Summer Row by row quilt top.they are due at guild this week, so I finally got the top put together. The top row had a lot of white background, so I planned from the start to add something there. I put a partial umbrella. What do you think? 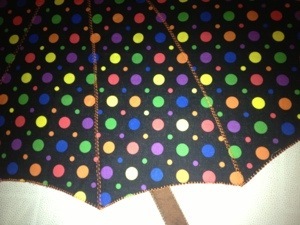 I appliquéd it on over everything, then did some fancy machine stitches to make it look like an umbrella. Your umbrella is too cute! Perfect!